Racing were better, bigger, faster, classier and craftier. Munster were gutsy, and gallant. We just didn't start well and Racing knew where to strike. We were caught cold on a roasting hot day in Bordeaux. The painter Goya lost the head in this city, through no fault of his own, mind. It wasn't down to a careless undertaker, a negligent surgeon or a haircut from Madame La Guillotine. But we seemed to lose the head early on. Racing were well up for it and Munster just didn't get to the pace of the game. There will be no All-Ireland final in Bilbao. 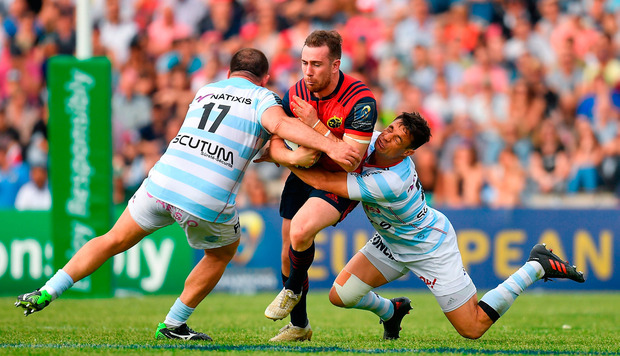 Munster staged a fightback when the Racing boys were wilting in the heat. By then we had a very exciting back line with JJ Hanrahan and Simon Zebo running rings around Racing. I'm not quite sure why Zebo didn't start, but he was injured for much of the season. Yes, the game was over when we rightly got going and maybe Racing weren't as motivated, but if this was a group match Munster would have been happy with a losing bonus point. You would have to be proud to be Munster. Most other teams would have given up, but our boys died on their shields. It's not the killing of a man, but how he dies, and we died like men. Anyway, just to get back to Goya, and how it was he lost the head. It was the phrenologists what done it. They robbed Goya's head. Phrenologists believed lumps on the cranium held the secrets as to why geniuses are geniuses. Dan Carter, rightly regarded as a genius, made two try-saving tackles. JP Doyle, the ref, made another one when he got in the way. But he did a good job overall. The old days of 20,000 fans turning up are over for now. I would say the split was about 50-50. Back when Munster travelled in big numbers to this very stadium in 2000 it was paid for by plastic cards, cheap air fares and by telling the credit union a loan was needed to fit the child with braces. But now the fans are more responsible. The age profile is older, too. The young crowd just couldn't afford to go. But the Munster fans still showed up in their thousands. You will never be alone when you wear the Munster colours. They mind each other. They party and they care. We met Trevor Brennan, who was stolen from a Munster cradle. Trevor was hydrating and we were invited back to his Brennan's Snug in Seilh, near Toulouse. He stood in for a photograph and his pal Doug remarked: "Frame that for the mantelpiece to keep the children away from the fire." They love him over here. Trevor warned us Racing had too much power for Munster and he was right, until the French ran out of steam. Every time they took us on they got that extra yard. Munster put their bodies on the line, but their bodies weren't big enough. It was Trevor who warned me about the rail strike. I have to try to get to a place called Bergerac and from there to Stansted and from there to Kerry. The trains are out tomorrow. I texted the bar staff: "There's a rail strike." The reply was: "Isn't there always?" Now I can share in the suffering of the little boy who cried wolf. There really is a rail strike. The good news is the weather is roasting here. Big men shed kilos. Water, water everywhere, but being Irish we didn't drink any. I saw dehydrated men with their tongues flapping to one side like a greyhound after a gallop up a hill. I suppose it's time to talk about the match again. Munster missed too many tackles and the better team won, but I wouldn't be giving up on Munster any time soon. JJ Hanrahan was excellent. He is a very good attacking out-half and not only did JJ chase the game, but he caught up with it as well. It was galling to see Donnacha Ryan playing for Racing. He was professional and drove on his new team. When he came over to the Munster section in the stands Ryan was given due recognition. When Simon Zebo was subbed in, the team came alive. He is also on his way to Racing. It seems strange that we can keep our best horses at home, but not our best players. We need to change the financial model by augmenting Munster's finances with some sort of a membership scheme. Twenty-five thousand times €100 would be a good place to start. Money doesn't guarantee success, but it will keep our boys at home. Today the supporters showed that kind of unconditional love a team needs when they go more than 20 points down. I am certain they will respond. This isn't about buying success; it's about keeping successful players at home, where they belong, among their own. Our coach Johann van Graan seems to understand the Munster way. He is still learning and Munster are still learning as a team. The players were hurting for the fans. The Munster team felt they had failed the supporters, but the Munster followers sang The Fields and Stand Up and Fight as if the team had won. For me it was a symphony of empathy sung for a team who did their best.